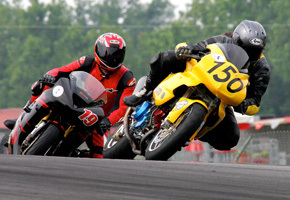 A five minute visit to the last track day of the 2007 season at Grattan Raceway. 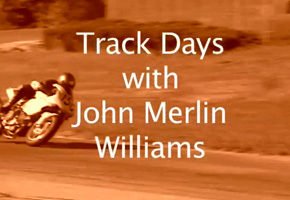 A big thank you to Chuck Severance ("Dr. Chuck") who shot the video and edited this piece, all because I complained that the web video of his return to (now, vintage) motocross racing after 24 years was so much cooler than my cheesy onboard videos. Thanks also to Ronnie Barnes who composed and performed the music. 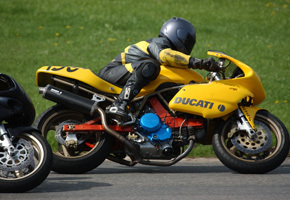 See "Dr. Chuck Goes MotoCross Racing"
It's not racing, but passing is still fun when done safely. 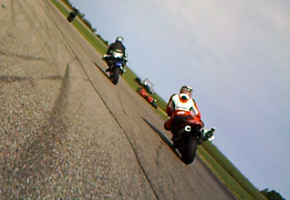 I've just been passed by four riders on the straight, and I get three of them back before we roll back into the pits. I pass 5 guys in two laps - okay, it means something to me :-) Grattan is my "home" track - it's my favorite and pretty challenging (5 of the 11 corners have blind entries, 2 of the 11 are off-camber). I was having an unusually fine weekend at Grattan, turning in my best personal times since racing in 2002 in the 1:33 range. This was looking to be my fastest lap of the day when I hit the dip coming out of the Bus Stop and lifted the back end on the right peg. Crashing is never good, but having the camera running made up for it - sort of.